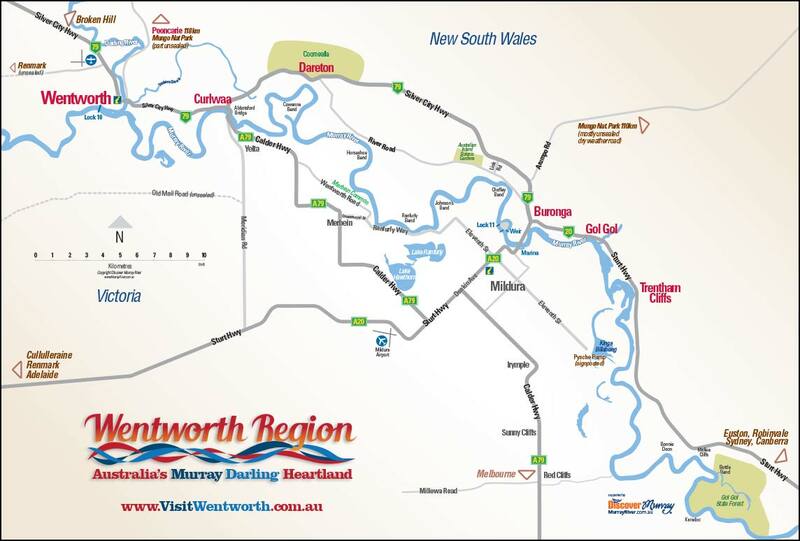 Wentworth is considered the gateway to Outback NSW, and is situated on the junction of the Murray and Darling Rivers in south­western New South Wales. Mildura, situated on the Victorian side of the Murray, is the nearest commercial centre of any size. The area can be an arid and harsh landscape or a landscape that is soft and serene in solitude. It is a land of rivers, creeks and lagoons; miles and miles of saltbush, acacia, casuarina and mallee, wide flat plains, drifting desert sands, red roads and cobalt blue skies. Wentworth’s climate is semi-temperate. Highest maximum temperature officially recorded was 48°C on January 10, 1939. Lowest minimum was -5°C in June 1907. Summer average is 31°C and Winter average is 16.7°C. Tourism is strong within the Wentworth/Mildura region. Each year there are more than 300,000 visitors to the junction of Australia’s two greatest rivers. More than 50 motels, in excess of 30 caravan parks and over 100 houseboats provide the visitor many different accommodation options.